It was sadly predictable. Neal Adams’ latest take on Deadman was disappointing. I went into it with pretty low expectations, but I suppose hope springs eternal and I was wanting to see if he could do something with the character that really made his career take off, but it wasn’t to be. Overall, it was incredibly derivative of his first Deadman run, bringing out Nanda Parbat, the league of assassins, Tiny from the circus, Rama Kushna and on and on and on. 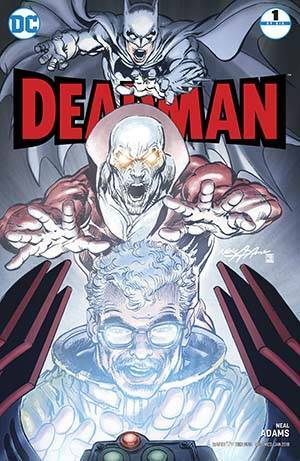 Being a nostalgia guy, you’d expect I’d enjoy it, but it just seemed like there weren’t any new ideas for Deadman, so Neal mined all the old stuff, throwing in some extra characters like the Phantom Stranger, Spectre Doctor Fate, Zatanna, Ra’s Al Ghul and the Demon and it didn’t really fit together very well at all. Basically, it was incomprehensible, at least to me. 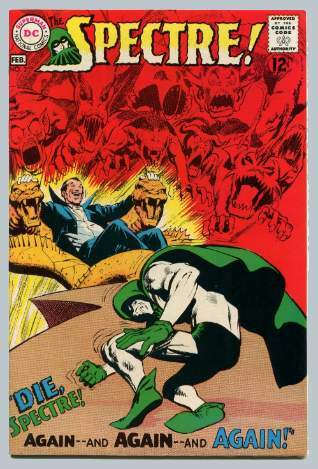 It did, however, serve as a reminder that we’re overdue for a classic tale of the Spectre, back when he was an enjoyable character to read, so without further ado, let’s take a peek at the disembodied detective’s first solo series. It’s issue #2 with a publication date of January/February 1968. Neal Adams did the cover art as well as interiors and “Die, Spectre—again!” was written by Gardner Fox, all under the editorial guidance of Julius Schwartz. The tale begins with a mugging in Gateway City. A citizen is threatened by a thug and ordered to hand over his valuables. Strangely, there’s no gun, but one materializes in the thief’s hand. Non-plussed, the guy makes with a left hook and takes the weapon away, only to fall victim to a blow from behind. Stunned, Dirk Rawley, the mugger, notes that this new figure is dressed exactly like himself, but lacks a face. The figure calls him by name and instructs him to look upon him so that he can gain an identity and within moments he is the exact double of Rawley. The figure further explains that he is Dirk Rawley’s etheric self, something that had always been part of him but was now released due to the intense emotions from the fracas. He then bids Dirk Rawley farewell as he is going to the “…ancient, demon-haunted town of Arkham…” to bathe in its evil emanations and to gather strength. A few nights later some mysterious, seemingly impossible robberies have taken place. A bank is looted despite the time-locked safe and a gem collection is also gone, but the seals are unbroken. Naturally, detective-Captain Jim Corrigan is assigned the case and to make sure he’s got plenty to do, he’s also in charge of the annual policeman’s ball. Right about then, the spirit sleuth, the Spectre arrives back from a Justice Society of America assignment. So, the Spectre is about to take 5 in Corrigan’s body when Jim protests that he’s got a date with Mona Marcy and would like some privacy. The spirit agrees after he takes a few minutes to restore his psychic energies. Flipping a couple of pages, we come to the lettercol where it’s explained that Murphy Anderson is being replaced beginning with this issue by Neal Adams and that beginning in the next issue, lettercol regular Mike Friedrich would begin scripting. The story takes up again with Jim meeting up with Mona, who he first met while investigating the death of Ace Chance. (Where’s the editorial reference, Julie? Well, I can fill that in. Ace Chance was on the Spectre’s radar in Showcase #64. [Sage #84]) Later at the ball, Jim introduces Ms. Marcy to their star act, magician Dirk Rawley. Right about then, the Spectre takes leave of Jim and his thoughts reveal that he’s learned about the robberies, but his ghostly intuition tells him they were perpetrated by a spirit creature, so he’s off to the crime scenes in search of clues. At the bank vault, the discarnate detective is able to discern the lingering presence of evil, but before he can investigate further, he experiences the power of those evil energies, which threaten to tear him asunder. Gardner Fox uses some $20 words to describe it: “As the eldritch forces in the vault tear at the ghostly guardian like a thaumaturgic tornado…” Our hero manages to escape intact, and then goes to the site of the jewel heist where he’s able to trace an ethereal trail that leads him to a museum and Dirk Rawley, who threatens the Spectre with powers superior to his own. Super-charged from his stay in Arkham, Rawley is spoiling for a fight and the battle is on, with etheric forces going back and forth between the two combatants. Using classic magician tropes, like rabbits, flowers and playing cards, the wicked figure pulls out all the stops and while he remains on the defensive, the Spectre is able to ward off each threat, but he is delayed just long enough to lose his foe, who has departed with pieces of art. Back at Jim’s apartment, the Spectre brings his alter ego up to speed, even explaining how an etheric body works and additionally going into a little bit of history about how bilocation had been documented as far back as the 1700s. Meanwhile, in this day and time, the disembodied detective mulls over how they can stop this one and he speculates that if he and Corrigan were to simultaneously hit each incarnation, they might be able to knock it out of existence. 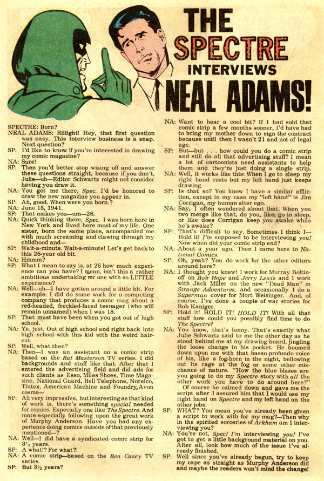 NEAL ADAMS: Riiiight! Hey, that first question was easy. This interview business is a snap. Next question? SP: I’d like to know if you’re interested in drawing my comic magazine? SP: Then you’d better stop wising off and answer these questions straight, because if you don’t, Julie—uh—Editor Schwartz might not consider having you draw it. NA: You got me there, Spec. I’d be honored to draw the new magazine you appear in. SP: Ah, good. When were you born? SP: Wait-a-minute. Wait-a-minute! Let’s get back to this 26-year old bit. SP: What I mean to say is, at 26 how much experience can you have? I mean, isn’t this a rather ambitious undertaking for one with so LITTLE experience? NA: Well—un—I have gotten around a little bit. For example: I did some work for a competing company that produces a comic mag about a red-headed, freckle-faced teenager (who will remain unnamed) when I was 18. SP: That must have been when you got out of high school. NA: Ya, just. Out of high school and right back into high school with this kid with the weird hair-cut. SP: All very impressive, but interesting as that kind of work is, there’s something special needed for comics. Especially one like The Spectre. And more especially following upon the great work of Murphy Anderson. Have you had any experience doing comics outside of that previously mentioned--? NA: Well—I did have a syndicated comic strip for 3-1/2 years. SP: A what!? For what?! NA: A comic strip—based on the Ben Casey TV series. NA: Want to hear a cool bit? If I had sold that comic strip a few months sooner, I’d have had to bring my mother down to sign the contract because until then I wasn’t 21 and not of legal age. SP: But—but…how could you do a comic strip and still do all that advertising stuff? I mean a lot of cartoonists need assistants to help them and they’re just doing a single strip. NA: Well, it works like this: When I go to sleep, my right hand rests but my left hand just keeps drawing. SP: Is that so? You know I have a similar affliction, except in my case my “left hand” is Jim Corrigan, my human alter ego. NA: Say, I often wondered about that. When you two merge like that, do you, like, go to sleep, or like does Corrigan keep you awake while he’s awake? SP: That’s difficult to say. Sometimes I think I-- Hold it! I’m supposed to be interviewing you! Now when did your comic strip end? NA: About a year ago. Then I came here to National Comics. SP: Oh yeah? You do work for the other editors around here? NA: I thought you knew! I work for Murray Boltinoff on Bob Hope and Jerry Lewis and I work with Jack Miller on the new “Dead Man” in Strange Adventures, and occasionally I do a Superman cover for Mort Weisinger. And, of course, I’ve done a couple of war stories for Bob Kanigher. SP: Hold it! HOLD IT! HOLD IT! With all that stuff how could you possibly find time to do The Spectre? NA: You know, that’s funny. That’s exactly what Julie Schwartz said to me the other day as he stood behind me at my drawing board, jingling the loose change in his pocket. He boomed down upon me with that basso profundo voice of his, like a fog-horn in the night, bellowing out his rage at the fog or some other mischance of nature. “How the blue blazes are you going to do my Spectre story with all the other work you have to do around here?” Of course he calmed down and gave me the script after I assured him that I would use my right hand on Spectre and my left hand on the other jobs. SP: WHAT? You mean you’ve already been given a script to work with on my mag?—Then why in the spirited sorceries of Arkham am I interviewing you? NA: You’re not, Spec! I’m interviewing you! I’ve got to get a little background material on you. After all, look how much of the issue I’ve already finished. SP: Well since you’ve already begun, try to keep my cape as straight as Murphy Anderson did and maybe the readers won’t mind the change! Pretty fun little piece, huh? Now, back to our story. A handful of days later, Corrigan, once again accompanying Mona, is at a Dirk Rawley performance while the Spectre is trying to meet up with his spirit double to deliver the concurrent knock out. Communicating telepathically, the ghostly guardian instructs Jim to deliver the blow, but when he approaches the stage, Rawley ducks the punch and Corrigan is hauled away. The Spectre, meanwhile, has landed his punch, but all it does is antagonize the other Dirk and yet another vicious fight is on. Ultimately, the etheric Dirk Rawley shrinks and imprisons the disembodied detective inside a gemstone, but it has weakened the fiend and he returns to Arkham for another charging session. Meanwhile, the imprisoned Spectre flings himself about and as luck would have it, he discovers a diamond nearby. He manages to strike the enchanted ruby prison against it, scratching it just enough to weaken the gem’s structure. He then flings it against a radiator, shattering the ruby and freeing him at last. He then decides to look up his alter ego to see what went wrong. After having to surrender his badge. Corrigan explains what happened and he and the Spectre plot their next move. After a couple of days surveillance, Corrigan follows the corporeal version of Rawley into an amusement park and Dirk boards an airplane ride, but it’s full up. Corrigan decides he cannot fail again, so he enlists the aid of a friend operating the human cannon event and gets himself fired at the ride while the Spectre does his countdown in Jim’s head. Finally, the two heroes synchronize their respective punches and succeed. The ghostly guardian then takes the inert ethereal Rawlins to Arkham and using his formidable powers, encases him in “good” radiation that will leave him in that suspended state for all time. Back in the real world, the physical Dirk is placed under arrest for the art gallery robbery and Jim Corrigan is restored to his former position and rank, wrapping up this case. Gardner Fox always could spin a pretty good yarn and of course this was the beginning of Neal Adams’ finest work, in my humble opinion, so this was an enjoyable time spent in DC’s Silver Age and I even got exposed to a few terms I’d never heard before. The “interview” was just some nice icing on the cake. I think for a good ol’ detective story with supernatural elements and sophisticated art, I’ll give it a 9 on the 10-point scale. Sadly, this solo series would only go 10 issues, but you can’t keep a good ghost down. It’s ironic to think that just about exactly 50 years later, Neal is still drawing this character among others for DC Comics. Come July 15th, it will be time for a new review and in the interim, well, you know what to do. Just exercise your right to free speech and send me an e-mail to: professor_the@hotmail.com.